A rather cool small chalet ideal for a family or group of friends with super views of the mountains from the balcony and terrace. Located in Méribel village near a restaurant, bakers, sports shop and the du Golf ski lift which links onto the 3 Valleys circuit. Close also to the ski bus (free) stop which runs to Méribel centre. Chalet accommodation covering 60 m² on 2 floors for 5 people, 2 bedrooms, 2 shower rooms, wifi. The ground floor has a living and dining room with single sofa bed and television, opening onto the west facing terrace. Open plan fully equipped kitchen (with small dishwasher, oven, induction hob, refrigerator etc.). Shower room with hairdryer and toilet. The upper floor has a master double bedroom (140 cm x 190 bed) with television, safe deposit box, access to the balcony which has super views and en-suite shower room with hairdryer and toilet. Family bedroom for one to three people (one single bed and a two pull-out single beds). Separate toilet. Méribel village centre 100 metres. The nearest ski slope is the Piste du Lapin 200 metres. The nearest ski lift is the Télésiège du Golf 200 metres. Ski school 3 km. Chambery airport 100 km. Geneva and Lyon’s airports are both 180 km. Moutiers railway station 20 km. Méribel village is charming and within ten minutes by ski lift or bus, you can reach the main resort centre which has a great choice of traditional bars and restaurants as well as an indoor swimming pool complex. The skiing on the 3 Valleys circuit is some of the best in Europe and there is plenty for all grades and excellent ski and snowboard instruction too. 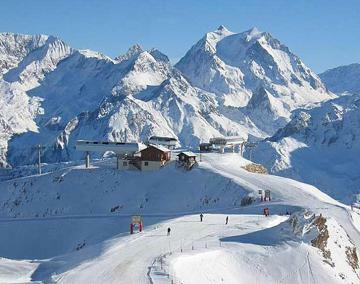 A family resort which has retained its charm Méribel is a top ski destination. Security deposit 1000 euros payable by card slip (not cashed unless required).